OUT-CROP COAL being mechanically loaded at Linley near Broseley was one of the interesting operations seen by members of the W.A.E.C. during their tour. OPEN-CAST coal sites in the Wrekin area, which had been re-seeded under the auspices of the Shropshire War Agricultural Executive Committee during the summer, were inspected by members of the committee on Monday. Accompanied by Mr. A. B. A. McCall, area production engineer of the Ministry of Fuel and Power in charge of open-cast workings in Shropshire, the party, which included Capt. E. Foster (chairman), Viscountess Boyne, Mr. J. W. Reid (executive officer) and Mr. Charles F Horrell (secretary, County N.F.U.) afterwards expressed satisfaction at what they had seen on the four sites visited. The working of the various sites and the methods used for restoration of the land after the removal of the coal, were explained, and questions were put by the members of the party as to whether the huge excavations were justified by the results. They were told that the actual cost of the coal per ton would prove much less than various reports had anticipated. Though not permitted to divulge specific details, an official informed them that the cost, when eventually made known, would “probably stagger them”. It was pointed out that when previous estimates of the cost of the coal were made the scheme had been in operation a relatively short time. Expenditure had included the provision of vast quantities of equipment which, over the short period under review, counted for the apparently high cost of the coal, but when considered more logically on a long-term basis, the actual cost per ton would be materially reduced. 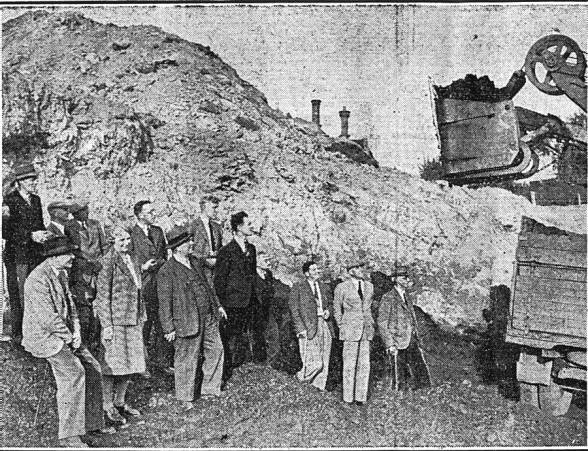 On the subject of the length of time needed for the removal of the top- and sub-soil to get down to the coal itself and then for the restoration of the land afterwards, the visitors were told that once a seam had been reached one man working with a mechanical shovel could remove no less than 500 tons per eight hour shift, and experienced mining labour was not needed. A few skilled mechanical operators and a sprinkling of other labour was all that was required. Regarding the effect on the land, it was stated that former difficult scrub land, having been restored and re-seeded, gave apparent promise of good pasture, and the party actually saw one site upon which stock was grazing. Sites visited were New Works, Little Wenlock and Linley Green, and at the latter the party saw a coal seam being removed by a mechanical shovel and loaded on to a constant stream of lorries.